Diff case built onto the bulkhead. Extra support for hinge pins. 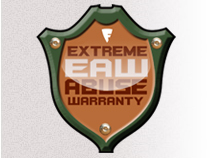 Fast Lane’s extreme abuse warranty. Replacement cost per side $15.00. The design is lighter when compared to other aluminum bulks and diffs. Lightweight is achieved by removing material out of areas were it once was not possible. These are by far the strongest bulkheads available. By machining the diff case onto the bulk, the bulkhead is now bolted together from the side. Instead of held together by the bulk brace, chassis, skid plate and shock tower. Now these items are strengthened by this design. By using this design you can also make other parts significantly lighter, because they are no longer a deciding factor in the strength of the bulkhead. For even lighter weight you can toss out the bulk brace, it will no longer be needed with this design. The Bulkhead has even had a revision with this design. Now the hinge pins have an extra support to resist bending. Driveline strength with design has greatly been increased. With absolutely no movement or flexing of the diff case the gears will not try to separate, greatly increasing the life of your gears. Option parts available for this bulk design. Now even lighter weight shock towers and skid plates.